In his final report before stepping down as a human rights expert, Richard Falk calls on the UN to back a “legitimacy war” against Israel. 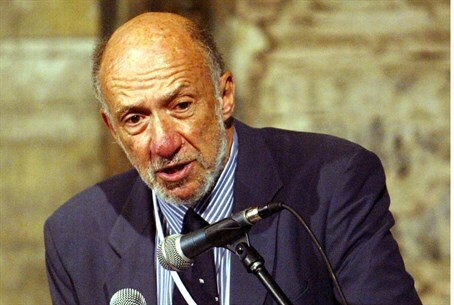 The UN Watch NGO on Tuesday exposed a new anti-Israel report authored by Richard Falk, the United Nations’ special rapporteur on the areas controlled by the Palestinian Authority. In the latest report, Falk, who has a history of anti-Israel statements, accuses Israel of “inhuman acts" and calls on the world body to support a “legitimacy war” against the Jewish state. Falk’s 22-page report repeats his past allegations concerning Israeli communities in Judea and Samaria, revealed UN Watch. He also offers a lengthy and detailed section arguing that Israel is guilty of “inhuman acts" and “murder” as defined by the International Convention on the Suppression and Punishment of the Crime of Apartheid. "Falk's report makes no mention of war crimes or human rights violations by Hamas, Islamic Jihad or the Palestinian Authority. In fact, the word 'Hamas' appears nowhere in the report, said Hillel Neuer, director of UN Watch. Instead, Falk points the finger at Israel -- and also at the UN, noted the organization. "It should be remembered that the suffering of the people of Palestine is inseparably linked to the partition arrangements initially proposed by the United Nations in 1947,” writes Falk. He also blames the world body for failing to implement the Goldstone Report’s call to prosecute Israelis for war crimes. He urges the UN to afford his successor “better protection” in this regard. Falk has repeatedly locked horns with Israel, the United States, Canada and some human rights groups for positions including labeling Israel's 2008 counterterror offensive in Gaza a war crime and urging a boycott of companies helping Israeli construction in Judea and Samaria. He has compared Israelis to Nazis and criticized Israel for keeping Islamic Jihad terrorist Khader Adnan in custody, even after a video of him pleading for suicide bombers to “carry the next explosive belt” was exposed. Falk consistently rejected calls on him to resign, claiming his opponents were trying to silence his criticism of the Jewish state by labelling him as an anti-Semitic. UN Watch noted that Israel recently returned to the Human Rights Council following a two-year absence, after Western countries finally agreed to admit Israel into their caucus. For decades Israel was the only country at the council excluded from any of the council’s five regional groups. "Despite the correction of this longstanding breach of the UN Charter's equality guarantee, the council continues to apply selective treatment against Israel, making it the only country permanently featured on the agenda of every meeting," said Neuer. "As in years before, the upcoming March session is expected to enact half of all its condemnatory resolutions against Israel. Moreover, there will be at least four reports presented on alleged Israeli violations, including Falk's," he added. "By contrast, there will be no special reports or resolutions on systematic human rights violations committed by major abusers such as China, Cuba, Russia and Saudi Arabia," noted Neuer, who pointed out that all four of the above countries were recently elected as members of the UNHRC.